An Important Personage is coming for dinner. In the days of Jane Austen this would be the new vicar or a wealthy landowner, but in these, less rarefied times, it is simply the Boy Wonder’s new boss. There are things I have learned about the new boss that cannot be repeated, but we are rolling out the welcome mat and laying the best white tablecloth (thank you, St Vincent de Paul) all the same. The funny thing – well, funny to me, anyway – about the Important Personage is that he has gout, which is just the sort of affliction you would expect him to have. Anyway, we are going to eat Shin of Beef with Ginger and Soy (from River Cottage Everyday), with udon noodles and steamed bok choy. Then, a Greek Orange Syrup Cake, which I haven’t made for years and years. A little note next to it in my recipe book says I first made it in 1999 for Vanessa’s birthday. Shamefully I can’t even remember the last time I spoke to Vanessa. But the cake looks good! 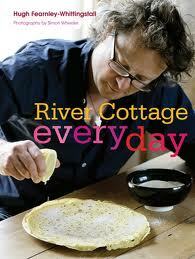 PS River Cottage Everyday is every bit as lovely – and useful – as you might expect. You can find more River Cottage inspiration at http://www.rivercottage.net/, including videos of Hugh making this very dish. Next Post What are the 50 best cookbooks of all time? This is wonderful. Gout ..oh dear. Seafood maybe. Or I could think of better reasons!